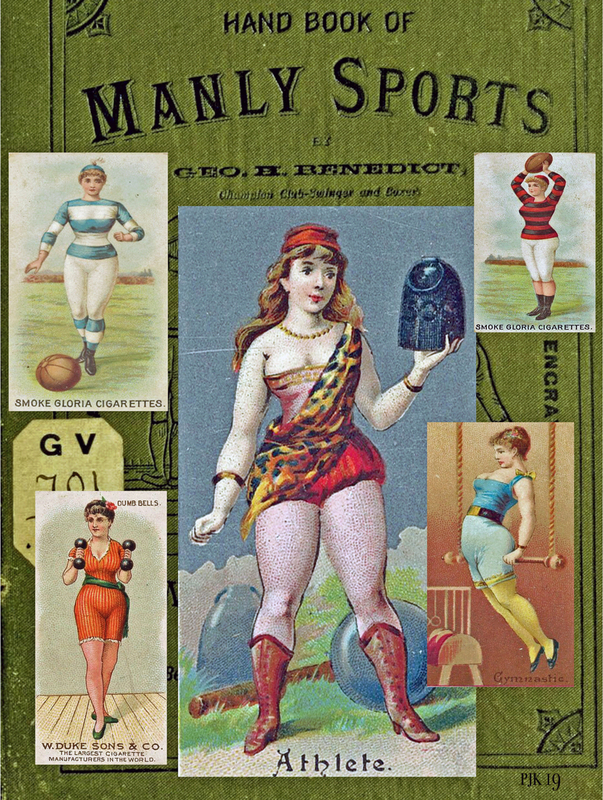 "MANLY SPORTS NOT MEANT FOR LADIES"
Found variety of cigarette cards from the late 1890's and early 1900's depicting women playing sports (though, God forbid, not smoking!) The cards were blown up, cut out, recolored, and mounted on a found 1883 book cover which was scanned and recolored. The book is "THE HAND BOOK OF MANLY SPORTS: Dumb-bell, Boxing, Club Swinging, Gymnastics Exercises, Swimming, Etc.by George H, Benedict published by A.G. Spalding & Bros. 1883. There were several versions over the years, but none for women. "Giving full instructions in the arts of boxing, fencing, wrestling, club swinging, dumb bell and gymnastic exercises, swimming, tumbling, etc. Containing over 250 illustrations, showing how every one can develop strength, skill and health." Except, then, women.